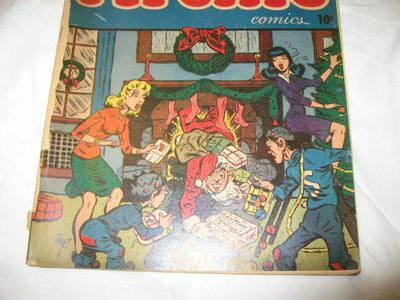 Comic is in great condition, with bright colors, good corners, all pages are there. Problem is detached cover, fairly straight except it took off part of the #6. Interior pages are nice, bright, off white. What would be the grade/value if I had the cover reattached (fairly minor as things go) compared to leaving it as is? [Editor's reply: Thanks for sharing this great old comic. 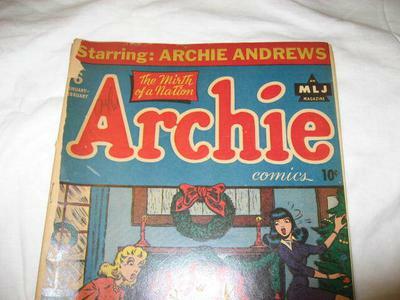 Archie comic books are still going strong over 70 years later, and more strongly collected than ever. This is a very scarce comic! There are only 8 copies graded by CGC to date. Unfortunately there is the tape repair. I can't tell from the pics whether there is still tape there, or there is color loss from old tape being removed, or both? Anyway, you definitely do not want to do any work on this book. I would leave it as-is. Restored comics are always worth far less than the same book in similar condition. You can check out values of Archie #6 here.